Easy to love and even easier to care for. What are succulent plants? The meaning of succulent as it relates to food is juicy or tender. 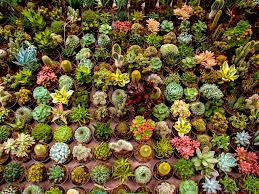 The definition of succulent plants is similar: plants that store water in leaves, stems, or both. There are many different types, species, and cultivars of them all, in a fascinating assortment of shapes, sizes, colors, and unique features ranging from frills to spines and beautiful flowers. To define succulents further, cacti are succulents, but not all succulents are cacti. They can be native to arid deserts, seaside cliffs, cold mountains, or even steamy jungles. Many will simply melt into mush if exposed to freezing temperatures, but there are quite a few which will grow outside during harsh freezing weather, as far north as Canada. Succulent means that the plants can tolerate prolonged drought, sometimes for months; most grow best in bright light, but not always full hot sun. What are succulents you may already be familiar with? 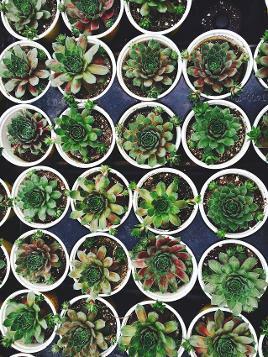 Favorite heirloom succulents with odd but familiar common names and somewhat recognizable Latin names include wax plant (Hoya), mother-in-law tongue (Sansevieria), jade (Crassula), crown of thorns (Euphorbia), hens and chicks (Sempervivum), century plant (Agave), prickly pear (Opuntia), burn plant (Aloe), stonecrop (Sedum), zebra plant (Haworthia), and many more. Other very popular succulent genera include Kalanchoe, Senecio, Echeveria, and Aeonium; word-search any of these and you will find many plants you have probably seen in garden centers or on other gardeners’ porches. Most succulents can live for decades with just bright light and occasional watering, plus a rare feeding with all-purpose plant food. They are not fussy, but sometimes have problems with mealybugs, scale, or other sap-sucking insects. Though some develop their best foliage color when exposed to a lot of light, many can burn in hot summer sun, particularly in humid climates. A sheer curtain may be needed for plants grown in a window with direct sun. Not enough light often leads to leggy, weak growth. Their worst enemy, other than freezing, is overwatering which can cause leaves to shed prematurely and rots their roots and stems. Avoid this by planting in a super well-drained soil containing organic matter plus coarse sand and either perlite or grit, and water only when soil is dry. There are several easy ways to propagate succulents. A lot have small plants called “pups” growing from short stems at their base, which can be twisted or cut off and replanted. Those with long stems usually root quite easily, but let cuttings dry for a day or more to heal over to reduce rotting. 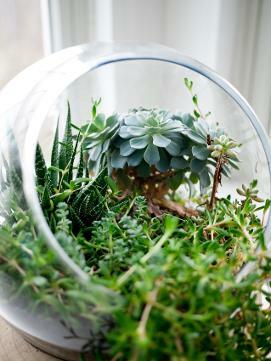 A surprising number of succulents can be grown from leaf cuttings or entire leaves. Some actually grow new plants on the tips of leaves or along flower stems. Simply stick them in potting soil and with minimal care they will quickly grow into mature plants. Use succulents as specimen or collections, indoors or out, in containers, rock gardens, hanging baskets, and wreaths and other wall plantings. For how little they need to thrive, succulents are remarkably giving. 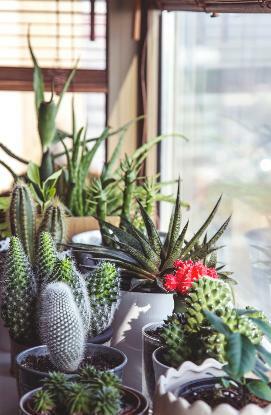 Like other houseplants, research has shown that succulents can help cleanse and dehumidify the air (which helps increase oxygen while deterring illnesses like colds and flus), boost healing by lowering anxiety, fatigue, and pain, and even lead to increased productivity at work when stationed at your desk. Unlike other houseplants, succulents have two superpowers that are extremely unique. 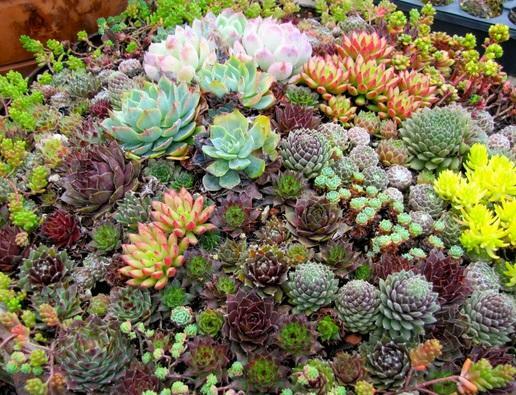 1) succulents preserve the consumption of water important in drought climates, and 2) they produce oxygen at night while your other plants are producing carbon dioxide, which makes them perfect for bedrooms. Visit our Succulent Care page to tend to your new baby hopefuls! Huddle them together as a centerpiece, line them up along your windowsills, or cover your entire desk with them. Your succulent subscription box is an excuse to exercise your green thumb AND your interior design skills. We have seen so many ideas on websites such as Pintrest and Etsy, everything from weddings to Christmas.